The Problem: It's hard to keep track of how much you spend on Uber rides. 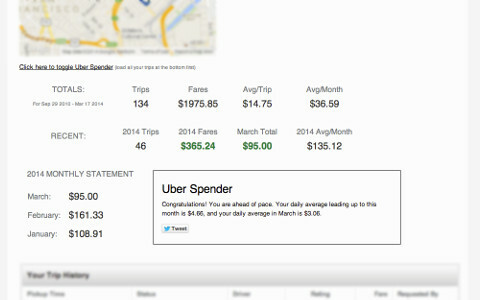 UberSpender is my first Chrome Extension and was created to help Uber power-users keep track of their spending. Your Uber trip data located in your dashboard on uber.com is organized into total and monthly breakdowns. Trip data and cost calculation are both done client-side, meaning your information never leaves your browser. It's a safe, reliable way to better understand your spending habits with Uber. UberSpender was a small hit and generated over 250 downloads and a $5 BTC donation in its first week. Download in Chrome Store No longer available.